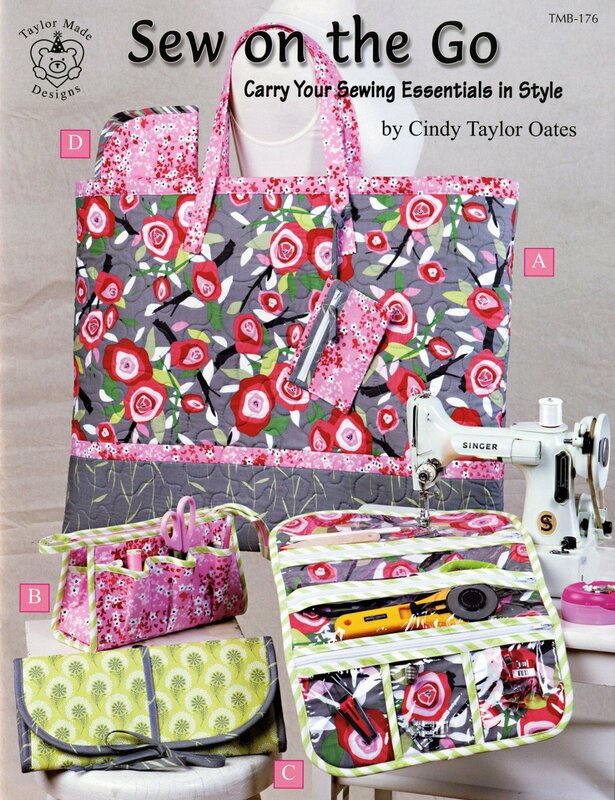 Sew On The Go by Cindy Taylor Oates features 5 projects that will have you arriving at your sewing class or retreat organized and in style. The giant tote bag pattern yields a tote that has a pocket large enough to securely hold an 18" x 24" cutting mat. This giant tote will also hold a Sew Steady acrylic table (the kind with removable legs) of the same size. To get a visual idea of the size of this tote, notice the large tote on the front cover image. The bag is draped over the shoulder of a full size/adult mannequin. The Ruler Cozy pattern yields a cover to protect your 6" x 24" acrylic ruler. The little zip pouch is perfect for storing small, important items you want to have quick access to, possibly your ID and a little cash. Additionally, there are two other organizers for thread, rotary cutters and various other supplies. These can double as jewelry or make-up bags.